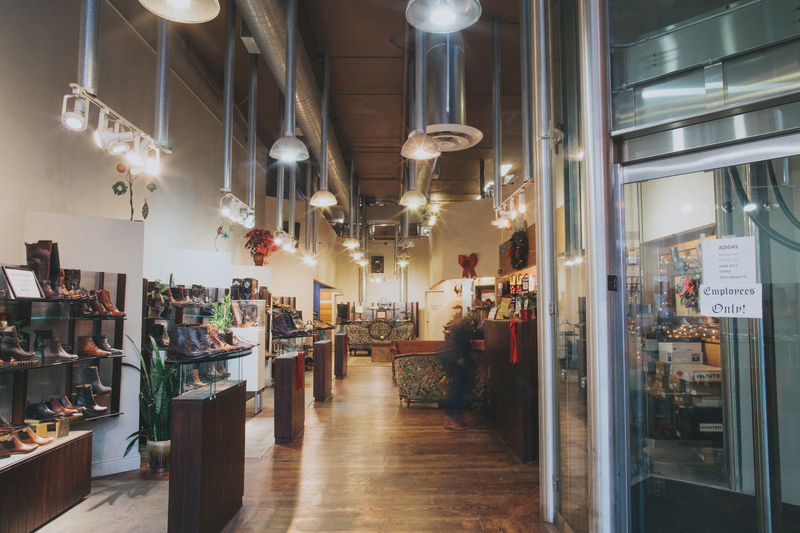 Shoe Biz is a small, unassuming footwear shop situated in one of San Francisco’s most historic and culturally influential districts. Nicknamed “the Dino Store,” evident by the rather large dinosaur statue sitting outside the storefront, Shoe Biz might seem like just another small business to foot traffic, but underneath the store’s large selection lies a rich history that’s pioneered what’s commonly known as the modern day boutique. Taking a walk down the block and you’ll arrive at the intersection of Haight and Ashbury, and near the end you’ll see a larger store front with yet another Shoe Biz sign. This store’s options are significantly different. Wolverine, Timberland, Red Wing, and SUTRO, the company’s own in-house private label, decorate the walls. The emphasis is quality and the target audience is a bit older. On the second floor used to lie the adidas Concept Shop, the world’s first ever privately-owned concept space which housed the finest of adidas product and made its mark for nearly a decade, before its eventual shutdown a couple of years back. This was one of many creations spearheaded by its owner Mehran Esmaeli, who made his way to San Francisco as a college student from Iran in 1979. Not flashy, or hyped, or exposed much in the media, Shoe Biz has an old school approach to doing business, built on strong relationships and a unique vision with how a business should be ran. Admittedly, the way Shoe Biz is run is not the most technically-sound way, but it’s one that uses the unique instincts of civil and electrical/structural engineering (Mehran and his wife Nooshin’s initial occupations by trade). With a digital industry that moves at lighting fast speeds, retail has changed drastically since Shoe Biz first opened its door as a part-time shoe store, part-time study hall, part-time residence for the Esmailis 35 years ago; But the incredible story of how this successful establishment, which now has 5 stores throughout San Francisco, is one that might have never been told due to Mehran’s humble nature. During a recent trip back home, I met up with my friend and mentor Mehran Esmaili to catch up. His story is one I’ve known for years, but I felt now was the appropriate time to tell it and show how much influence the man has had, not only in San Francisco, but in retail and the sneaker business as a whole. From opening the first Urban Outfitters store, to influencing the advent of quickstrike releases and giving sneaker companies the confidence to believe in small independent retailers, to founding one of the first million-dollar e-commerce platforms in 1996, the story of Shoe Biz is one of inspiration – and admiration. Below, in his own words, Mehran shares his past, present and future of retail business. I never planned to be in retail, never. It was a matter of survival. My wife Nooshin and I got married pretty young, we were going to school, studying, and needed some sort of financial resources to support ourselves. We started at San Francisco State University in 1979. Nooshin was in electrical engineering and I was studying civil engineering, but we didn’t have any source of income, so our problem was compounded when we didn’t have money or a place to live. We had to somehow find a place to live and support ourselves. I was born in Iran, I came here in 1977. I graduated high school and came with $200 in my pocket, landed in San Francisco, and that’s it. It’s really that simple. So getting adjusted to the environment, being away from your family, cultural language – there was so much to get used to. Then you add financial stress and education, education was our number one objective, it was all we were trying to do. Retail was subsidizing our education and that’s all we thought about. We never imagined a day that we’d be in retail. I never imagined a day that I would not be an academic researcher or professor. Our dream was to be involved in research and development. This is why Nooshin went into electrical engineering and why I went into structural. I became a forensic engineer looking at dams and levees that were failing – that’s what I wanted to do: Investigate. I think what we do now has a lot of application, the way that we look at our business numerically and scientifically. I think we’ve survived so many changes in the economy because we’re not business people at all; we don’t have a business sense. We do, however, have a numeric way in how we approach our business. I think we offset our lack of knowledge in business with numbers, with formulas, with logic. We’ve made huge, big, monumental mistakes in our business because we’re not very good business people. We started in 1979, learning how to survive and continue our education. We got a place on Haight Street, it was 600 square feet and that was a space for us to live and function out of, to get to go to school, so it all worked out. We used to go down to Los Angeles and buy shoes for a dollar in an alley. Defective shoes, overruns, mismatches, put them in a garbage bag, take the Greyhound Bus, bring them back to San Francisco and sell them for $2, $3, $10, $15. The revenue we made from the shoes we sold paid for our rent, for school, food, and so on. Our business model was to buy shoes so that we could survive. Again, it never was intended as a business model. A few years down the road, somebody came to us and said, “Look, you’ve got the retail space, why don’t you guys open it and sell shoes?” We couldn’t pay for utilities, we didn’t have any fixtures, and we didn’t have any credit. Who would do business with two kids with no experience and no resources? Nevertheless, we opened the doors to Show Biz in 1980. We literally opened for a few hours a day and sold shoes; whatever we could get. Our first store was where Goorin Bros. is today. 1446 Haight Street. That was our first establishment and we had it all the way through 2009 – 30 years. So we graduated from San Francisco State University and started our graduate work but still had no employees. We were going to school full-time, while supporting ourselves. We started making more money because I was teaching classes; undergraduate courses. Nooshin was doing the same thing, so the money that we earned, we put it back into inventory. But then again, our goal was, “As soon as we get our PhD, we run.” That was the whole point, making enough money so we could survive. A couple of really amazing things happened for us. A gentleman walked into the store one day and said, “Where did you guys get your adidas?” I told him, “There’s a warehouse that I found where I buy secondhand adidas.” They were all brand new, they just had torn up boxes. And he said, “I’m an adidas rep and I like what you guys have, so why don’t you carry adidas here?” I said, “We don’t have money to buy adidas.” He said, “I’ll invest.” I can’t remember his name. In 1982, you had to buy $10,000 a month of adidas to carry them. So he helped us bring adidas into Shoe Biz. The same identical thing happened with PUMA. A gentleman on a Harley Davidson, his name was Herb, he came to the store in 1984 and said, “Do you guys want to carry PUMA here?” I said, “How? How do we pay for it?” He said, “I’ll help you guys out.” So we brought in adidas and PUMA and we had other brands like Nickels, Nine West, and Zodiac. These were the brands that we could get off the street. We had no store hours, we closed the store, went to school and came back. I was doing my homework while selling shoes. Most of the time we didn’t have [electrical] power in the store. We could only stay open as long as we could see the shoes. [Laughs] I’ll never forget, Nickels, which were pumps, Nine West, Zodiac, No Names, adidas, PUMA, and then Converse opened us in 1986. Simultaneously with New Balance, they had never seen a store of that size carrying their product, except athletic stores. The modern boutique as we know it today did not exist back then. There was nothing like it. There were no stores carrying these brands at all. It was either a department store or nothing else. So it was an interesting concept to them, stores with no fixtures, no electricity, carrying these brands, two young kids running it, and the street was weird. It was like a war zone, there were empty stores, hippies everywhere, amazingly educated people. It was fun, it was incredible, Jerry Garcia was above us so the Dead Heads would just line the streets. The building we were in had two entrances. Jerry Garcia had the 4,000 square feet unit right above Shoe Biz. The first entrance was to the crack house and the other one was to whatever was going on there, I didn’t know what it was, I didn’t want to know. [Laughs] There were educated war veterans from the Korean war and Vietnam war. These guys were sophisticated, but they had social issues, so the street was vibrant. The model we started in 1984 was a bit unusual. It’s interesting, the same person, Jeff Marquis, that opened Converse for us back then, I’m still working with him now. Butch Hazel with New Balance. These people really had the creative mindset and out-of-the-box concept of finding a small retailer, 600 square feet, and putting their product in there, it was really amazing. It changed our look, we could get PG&E to put power in the store and we finally had the lights on. I got a consulting job and so did Nooshin, and we started funding the store with some of our salary that was left. We started looking at our business and saying, “Okay, how can we do this? We’re working as consultants during the day. We’re here Saturday and Sundays.” I used to finish my job and then come back and work at the store between 5pm and 8pm. So it was a different way of running a business. We weren’t into it but we loved it, it was fun. It was fun because I could really break from consulting and take that stress away from myself. Nooshin was working for a small company in San Mateo that was designing shuttle components and I was working for a consulting firm, which was involved in highways and levees in the Bay Area, so it was really stressful. We just didn’t like it, we didn’t like the corporate environment, the pressure. There was no personality in the companies we worked with. It was purely technical, so having a shoe store was fun. What we experienced in the ‘70s and ‘80s on Haight Street was nothing I could describe because it was so amazing, so dynamic. We used to have a banner in the store [that said] “Always Expect the Unexpected on Haight Street Because You’ll Never Know What the Next Day Looks Like.” You come to work and you knew something was going to happen, you just didn’t know what. Everything was different because when the traffic went up, for some reason, this place changed in the late ‘80s. One day I’m at the store, a friend of mine comes in, working at the Haight Ashbury Music Store, and says to me, “Rahn, the guy that owns Dino Store came to the cross on Ashbury, was about to make a right turn, a car hit him, and ran over his helmet.” The owner of Dino Store was in a coma, so he says, “Can you run the store for three months?” I said, “I can’t do it.” I had just picked up construction on Highway 85 and a $250 million dollar job doing the levees in Sacramento. I said, “I can’t do it. I got this big job, a project engineer, going south, going north to Sacramento, different parts, I just can’t do it.” He says to me, “Just for 9 days.” I said, “Okay.” So we took over his store selling dinosaurs. He trusted me with the keys, so we sold the product to pay the bills and put the money back in the account. I did not touch anything. This went on for 6 months and he said, “You gotta keep this thing, we can’t do it.” I said, “I don’t want to have another store. I can’t run it, I’m barely running what we already have.” And they said, “You gotta do it.” I said, “What do I do with the inventory? Inflatable dinosaurs?” So we said, “Okay, we’ll keep the store.” We met with the landlords, negotiated a lease agreement. We asked ourselves, “Why don’t we turn this into a clothing store? Because our shoe store is taking off like crazy.” So we opened the first Urban Outfitters store when Urban was not even public. Dino Store was an Urban Outfitters store called Anthropology. It was front to back one brand and we did numbers that were unimaginable. This was in January of 1991, we opened a store called Dino Store, carrying one brand, and that was Urban Outfitters. When they [Urban Outfitters] opened their own retail in 1993 we went bankrupt. So now we were stuck, but there was a blessing here. Nooshin started going to Europe in 1991 and working with an Italian manufacturer to bring shoes from Italy. So we brought Camper to the United States in 1994, no one knew what Camper was, we brought Camper shoes. To the point that when Doc Martens bought Camper shoes, we still bought from Camper, not Doc Martens, because we brought it to the United States. We brought in Buffalo here, which were Spice Girl shoes. We brought in El Dante platforms – it destroyed. So imagine, a 600 square foot store has PUMA, adidas, Converse, New Balance, Vans, and all the other brands that you would see in all of our stores today, all in a 600 square foot store doing over 3 million in sales. In 1994, we sold 11,000 pairs of PUMA’s in one door. 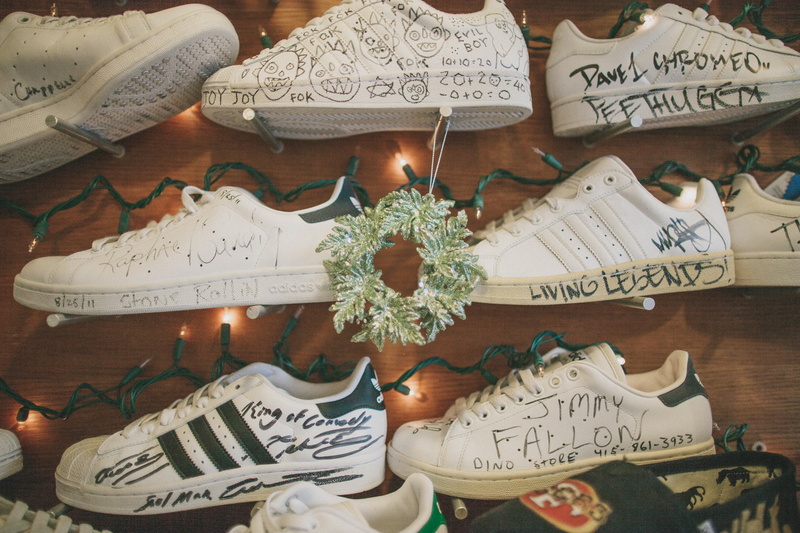 12,000 pairs of adidas, about 6,000 pairs of Converse. The concept of a sneaker store we literally started in 1994. It was so amazingly successful that we divided the store into two parts. We had only adidas track jackets and track pants, three colors only, three sizes, we would bring 100 pieces per size every week. Our apparel business was track jackets, navy, black, and red. It was unreal. So I quit my job, quit consulting. We were open seven days a week from eight in the morning to 12 o’clock at night. We never had hours, we opened the store when we got there, closed it way after hours. Customers in and out, in and out. Then opportunity came in to open a big store. There was a vacant lot and we wanted to own property on Haight Street, so we bought the building for $25,000. In 1994 we decided to buy a domain, which was really odd back then, since there was no e-commerce [as we know it today]. We were working with a 26K modem, online, and it was extremely slow, but we got lucky and met a brilliant programmer that helped us write the actual algorithm for Wells Fargo to take our credit cards. Wells Fargo didn’t know how to process credit cards at the time, so we wrote the formula and gave it to them. We said, “Okay, let’s present shoes so that people can see them in a 3D format.” So we took 17 images and we stitched them together, literally put it together. No Photoshop. We bought a Sony camera with floppy disks, it was over $1,400. We built a laptop in 1994, Windows ’95 wasn’t even out yet! We built it for $7,000 and then started taking pictures of floppy disks, stitching the images together so you could actually drag your mouse on an image on our site and turn it 360 degrees. It was incredible. The first year  we did a million dollars in sales online. In 1999, Yahoo Magazine voted us Top 300 best websites in the entire community. We had the exclusive right to Simple shoes, so they gave us all their online business and we did 600 pairs of Simple a week. It was huge, there was no source for you to buy product except through us. We just wanted to be different, it was never about profit. We never did anything that was designed to make money. There’s a difference between engineers and non-engineers – engineers don’t look at success as profit. Success has a very finite gauge. Structural failures is 3/10th of one percent, so you don’t see too many buildings collapse, you don’t see a dam collapse on its own weight unless there are supernatural conditions. That’s what we do, we don’t build things to fail. It may be over the budget, which most are because engineers aren’t good with money, and that’s what Nooshin and I are – we’re not good with money. But we’re always trying to find things that are different. When we developed our site, we said, “Let’s build a site that’s completely different. Nothing like it.” When we built the adidas store here, the first brand that dropped us was Camper. Camper said, “You guys are going to go down, we’re not going to sell to you.” They closed our account. They said, “If you put so much money on Haight Street, the big store it is today, you guys are going down, we don’t want to be a part of it.” It didn’t, it did $4.2 million the first year we opened. After buying the building, my wife said, “Okay, we’re going to open a store and we’re going to make it extremely high end, only European.” So she spent a year in Europe talking to factories, designing shoes, making shoes in the factories; then we opened the big store. The day we opened we realized it was the best thing we ever did. A banker came in, looked at our business and gave us an SBA loan, $600,000 construction loan, payroll in two years, no interest, no principle. That’s $600,000 that we put in to building the store and buying inventory. It changed us completely. 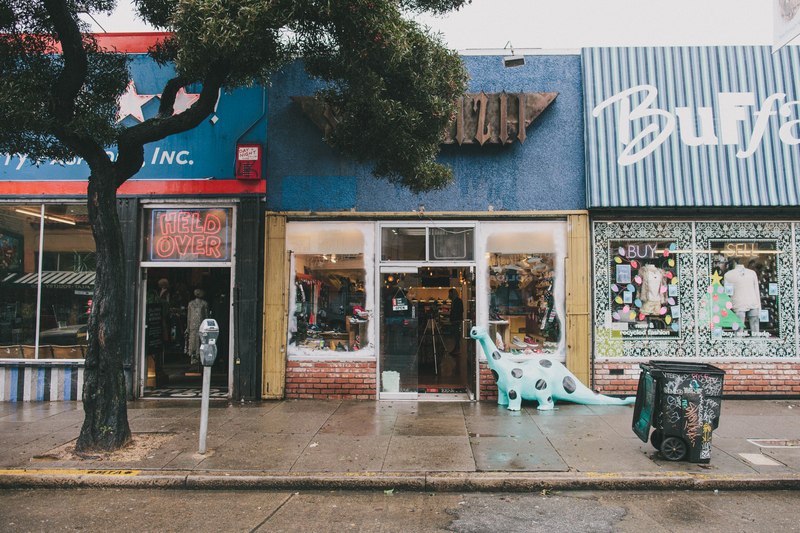 So Dino Store we opened in 1991 and we bought this building on Haight Street in December of 1999. Then we grew so big that we were looking for another store on the street. We could’ve had five stores on the street [at the time]. Opportunity came and we took over this spot on Valencia Street, another building came up so we bought that building as well. So in one year I had three construction sites going, while building the elevator to put in the adidas concept shop – so in three months, we opened three doors. Just imagine, I had two crews working 24 hours a day. Working at night to put the elevator here, working during the day to build the Noe Valley store, and then remodeling Valencia. We officially opened Valencia in May of 2003, Noe in June of 2003 and adidas in August of 2003. Back to back to back we opened three stores. Then we had six stores by September of 2003. 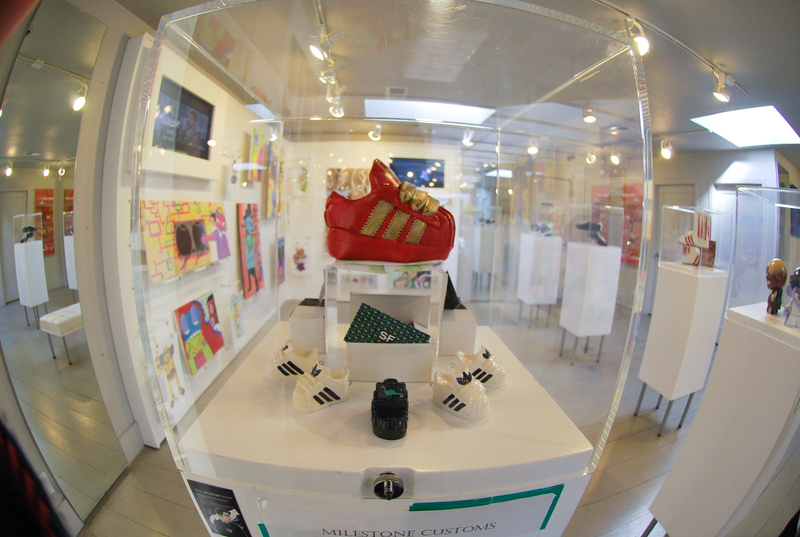 Of everything that I’ve ever done in the last 35 years, the highlight of my career was opening the adidas Concept Shop. We owned the only adidas concept store in the world then and today. I think Converse, Vans, PUMA, I owe it to them, if we are what we are today it’s because they walked into the store and said, “We’ll take a risk.” Mutually we kept our partnership with respect and integrity. Even in our numbers today, you would see our margins with the companies, it has really been a true partnership. Part of the reason Nooshin and I can still do what we do is that our relationships are very intimate, based on respect, based on 30 years of good partnership. Closing adidas really broke my back, it really did. I don’t think I can ever recover from it. If I close every store I have, it won’t hurt me as much as adidas hurt me. I wasn’t prepared for it. We spent $1.2 million, we built the store for one single use, elevator, permit process, the money we put into the legal battle to go before the city, the hearings, the 7 hearings, $358,000 in legal fees to register the second floor. This is the only second floor retail within a four mile radius of UCSF. You cannot have a second floor retailer on Haight Street, nor can you have a neighborhood commercial corridor in name brand, and we did it. It cost us everything that I owned, I had to sell my house to pay for legal fees. Literally sold my house to pay for the elevator. But once I commit to it, I’ll do it, whatever it takes, and I did it. When I decided to close it down [for financial reasons], I never went to adidas and said, “Hey guys, I sold my house and spent more than $35,000 to defend you.” They had no idea this is what I did, so this was a tough one. Currently, I have no plans for the space adidas left vacant. Four years ago, we sensed a change in retail and also a change in e-commerce. We were a pioneer in e-commerce in the ‘90s. But once Zappos came and now with the expansion of Amazon, I don’t think it’s feasible, economically, to maintain an e-commerce set up. 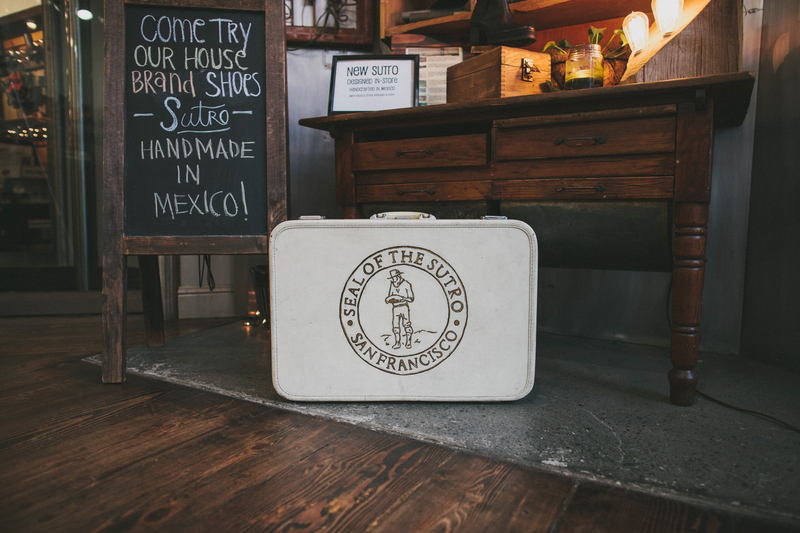 So Sutro Footwear is our in-house brand and that’s where we’re going to go. Retail has to adjust itself. SUTRO Footwear gives us the ability to put our experience behind developing an in-house, private label. There’s a DNA in SUTRO that is absolutely unmatched and we know it. If you look at a brand, there’s always a designer that’s under a lot of pressure. They [the brand] go to a designer, he or she, and say, “Why don’t you sit down and design a collection of shoes for us?” Doesn’t have a retail store, doesn’t have a retail background, it’s just a brilliant creative artist. So that designer has the disadvantage of not knowing what the public is looking for, we don’t. Nooshin does the design, we bring it to all our employees, we put it on the floor, we ask the consumer what they’re looking for. We give them quality. So we decided to look for quality number one, two, practicality that makes sense. How do we get you a pair of shoes that has the highest quality of workmanship that you know you’re getting a shoe that is handmade, has vegetable oil treated leather, no chemical glue in it or on top of it. It’s practical and it’s economical. We said, “Okay, if we can maintain this, we can develop a brand.” It took us two and half years of development, sourcing, getting leather, processing the leather. One and a half million miles of travel to get it to where it needs to be. 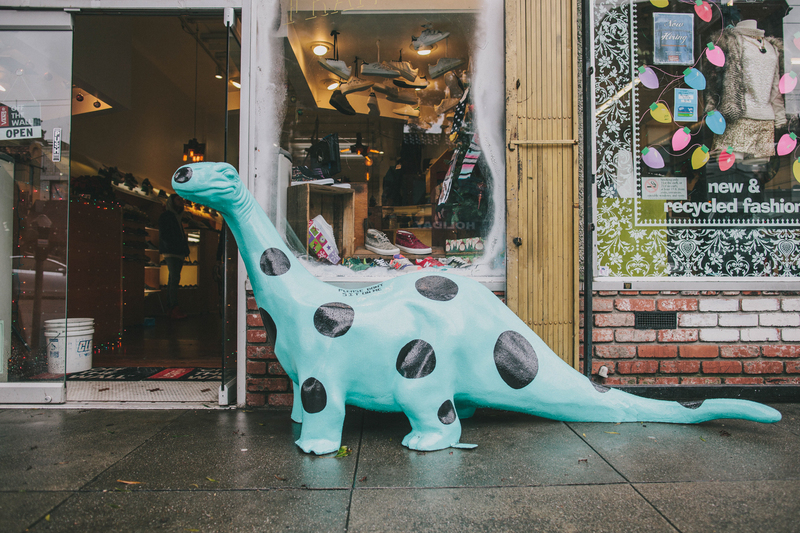 So I think our future is SUTRO, I think Dino Store is going to play a big role in our future as well. I think what vendors need to do is really, philosophically look at this thing and ask, “Do we want brick and mortar to be around?” And if you want them to be around the prescription is so simple that nobody looks at it. In 1998 I approached Converse and told them, “Let me bring Converse from Italy.” That’s when Converse was manufactured in the United States and owned by a group. They said, “Okay, go ahead and do it.” We brought Converse from Italy here, sold it at Dino, and what we did became part of the brand. Same concept with Nike, they picked up the same model that we practiced between ’96 and ’99, with Quickstrike. It was old school, take a handful of retailers, put their shoes in their stores, empower them to sell the product, and then go back and put it in public use. Give life back to independent retailers, but nobody is doing it. I think if a retailer today doesn’t plan for a day of not breaking borders, it’s making a huge mistake. You can’t sustain overhead, you can’t sustain rent, and you can’t sustain competing with someone who’s willing to sell Converse Chuck Taylor’s for $17.98. That’s impossible. My problem is, how do I maintain the quality of life for my managers who work so hard to make us who we are today? I was very lucky to have them, Nooshin and I would’ve never been able to become who we are today if we didn’t have the infrastructure. When I went to our managers and said, “Look guys, we’re opening three stores, can we do it?” They all said yes, and we did. We were successful. Not a glitch in the system. So how do I maintain that quality of life? How do I go to Jason [my manager] and say, “Jason, you have life for another ten years.” We work hard and there is pay off. Retailers are the hardest working people out there. They hold the key to all creative minds, they’re the ones that are making it happen. When you see a store remodel or you see a store open, do you know how much goes into it? We are the lifeline for the vendors out there and there is still an enormous retail opportunity. We don’t follow the trend, we set the trend. Did you know even today, our store policy states that if you buy an item from us and it goes on sale 90 days from the day you purchased it, you get your money back and keep the product? Our total discount, today, as a company is 1.04%. We’re not a discount store, we don’t go on sale. If we buy it, it’s ours, if we want to put it on sale, we made a mistake. Two guys, after 35 years, if they buy it and they want to put it on sale then they need to get out of this business. You should not be in this business if you want to put shoes on sale, something’s wrong. Nooshin and I are not doing the job right. So you buy it, you own it, you stand by it. Don’t put it on sale. Total margin of profit at Dino today is 49.84%. Not a single retailer in this country, I challenge anyone out there, stand before me, open their books legitimately, and show me a 49% margin on sneakers, I want to see it. I’ll open my book, but have the balls to show up here and be man enough to open up your books and show me 49%. Rest my case, you can have my store, no one can do this and no one will. There is a way to do this numerically and scientifically, but it needs help from the vendors. And this is the missing link, we don’t have partners who have balls to come in and say, “We want to save you.” We’re here, we’re not going anywhere, You come and talk to me 10 years from now and we’ll still be here. I may not have as many doors, but you can’t shake us, you really can’t. Nooshin and I are not shakable. I won’t let that happen, I’m a damn good engineer, I’m a damn good mathematician, and I’ll beat this thing. You can’t knock me out.